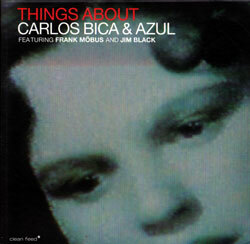 For their 7th album after 20 years of collaboration, double bassist Carlos Bica's trio Azul with Frank Mobus on guitar and Jim Black on drums presents this exemplary live album recorded at the 2015 Ljubljana Jazz Festival in Lsovenia, clearly illustrating their characteristic clean and lyrically melodic sound through beautiful textural and energetic playing. 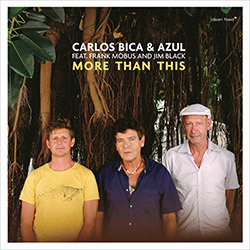 With a 20 year history, double bassist Carlos Bica's trio Azul with Frank Mobus and Jim Black have developed a romantic, lyrical style that balances unusual textures and agressive playing with melodic style in wonderfully natural ways, here in their 6th alluring album. 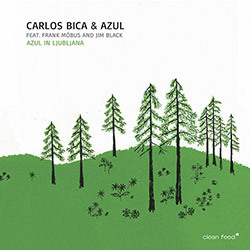 Double bassist and composer Carlos Bica's Azul with guitarist Frank Mobus and drummer Jim Black in their 5th album, bringing jazz and elements of rock together into a lyrical and alluring set of recordings.